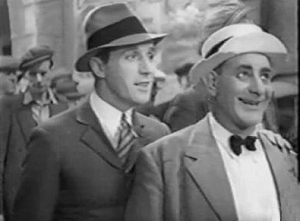 O-Kay For Sound was their first film in 1937 directed by Marcel Varnel and, although its cinematic technique was rudimentary, it remains a brilliant record of their comic skills, which drew on circus acrobatics, slapstick, quickfire cross-talk and a healthy disregard for social and cultural hierarchies. Further films included Alf's Button Afloat (1938), The Frozen Limits (1939) and Gasbags (1940) (all d. Marcel Varnel), wherein they uncover a secret German training camp for Hitler impersonators. 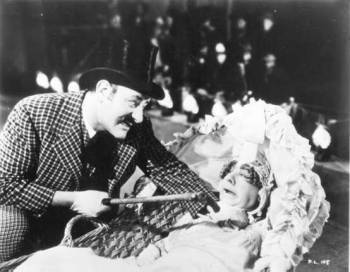 After World War II, they concentrated on stage work, though Val Guest's, Life Is A Circus (1958) was an affectionate final film for the by-then elderly Gang. Okay for Sound contains most of the Crazy Gang's best routines from their original London Palladium stage show, and is pretty funny in parts. Okay for Sound was the first of five Crazy Gang vehicles produced between 1937 and 1958. 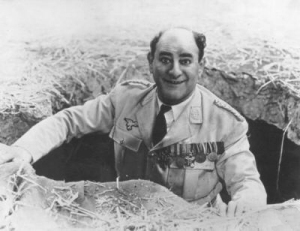 Hyman Goldberger (Fred Duprez) is the proud owner of the 'Super-Colossal' film studios. However, his major financial backer is threatening to pull out and so he awaits the arrival of another possible group of investors. On the same day his dim-witted runner, Albert, invites six of his street musician friends to the studio to play 'city types' in the film currently shooting. Hyman mistakes them for the wealthy film producers and treats them as royalty. In disgust, his entire staff departs leaving Albert, the six friends and his secretary, Jill, with the task of completing the film. 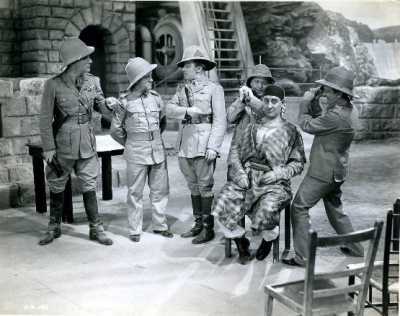 Wartime farce adapted from W.A. Darlington's famous play starring The Crazy Gang. Alastair Sim overacts wildly and tends to steal most scenes hes involved in. The story begins with Aladdin burying his magical lamp in the ground before his death. Years later the lamp is dug up and brought to England as a Persian souvenir, but due to wartime shortages is handed over as salvage and made into a button for a sailors tunic. Meanwhile, six busking brothers (The Crazy Gang) are enlisted by mistake into the Marines, and posted onboard HMS Invicta. 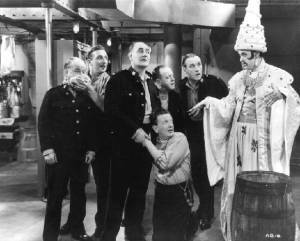 Alf (Bud Flanagan) is handed the tunic with the magical brass button and once rubbed it produces a genie (Alastair Sim) who grants his new owner any wish - Alf declares Strike me pink!" The genie duly obeys his new masters command and the ships doctor subsequently orders the vessel to be quarantined believing Alf has contracted an unknown disease. Its the Crazy Gang's craziest adventure as they do their bit for the war effort - and get it disastrously wrong! Assigned to barrage balloon duties to protect the skies from Hitlers Luftwaffe, they just cant seem to get the hang of it. Worse still, a sudden gust of wind sweeps their balloon away up into the sky - with the gang still clinging hold of the ropes! Swept into Occupied France, they prove no match for Hitlers stormtroopers and are soon Prisoners-of-War. But inside the POW camp they learn of a dastardly German secret weapon - and must risk everything to get back to Blighty with the news! Made in 1940 and starring the cream of British comedy talent, Gasbags captures the legendary Crazy Gang at their very best - larking about and defying Adolf! The story begins as the gang are busy sweeping up for the almost bankrupt circus they work for. The owner of a rival carnival endeavors to put them out of business for good. The Crazies manage to foil his evil scheme after they find a magical oil lamp containing a helpful genie. Along the way, the troupe performs a variety of speciality acts including a comic trapeze act, juggling, magic and songs, which include: "Life is a Circus", "For You, For You", and "Underneath the Arches".